Have you got a pan in your house that is covered in blackness that won't wash off? I have a cookie sheet that looks like that. I keep thinking I should throw it out, but then I keep it for when I think the thing I'm cooking is likely to do damage to the pan. These days, I cover it in tinfoil so that I can see that the food is on something clean- I'm telling you, I do clean the cookie sheet, but you can't even tell by the way it looks! 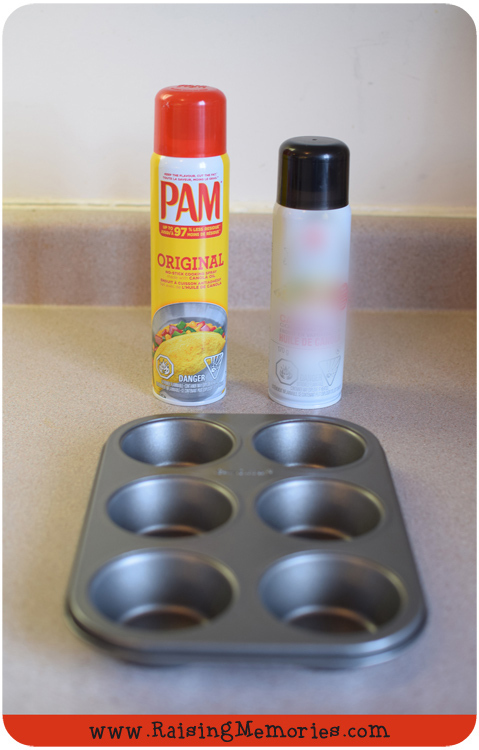 Cooking spray residue can be a true annoyance so I was happy to take on the challenge to compare PAM's cooking spray to another brand and see if it holds up to the claim that it leaves much less residue than other sprays. I found a couple of interesting differences during my experiment so let's get to it! To be fair about this comparison, I bought a new muffin pan. I used PAM on one side and another brand on the other. When I sprayed the pan, I used a piece of plastic wrap to block off the other side of the pan so that there would be a straight line divide between the two types of spray. 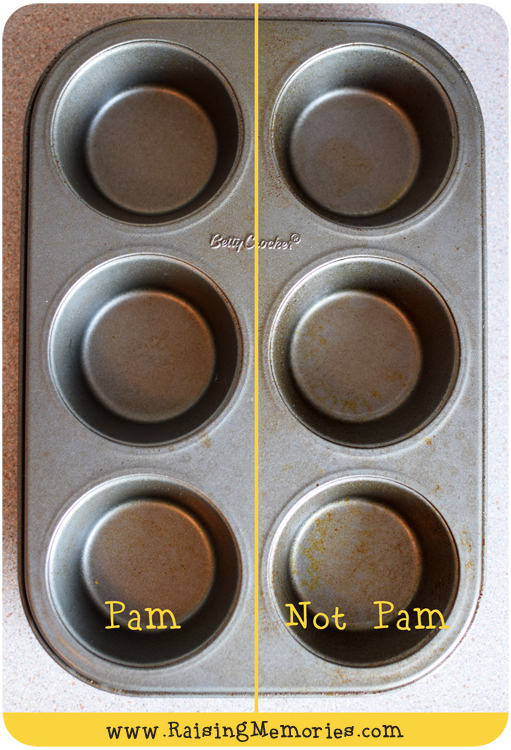 It looks to me like PAM would hold up better over time as far as keeping your pan from turning into a nasty looking mess! My muffins came out nicer with PAM! 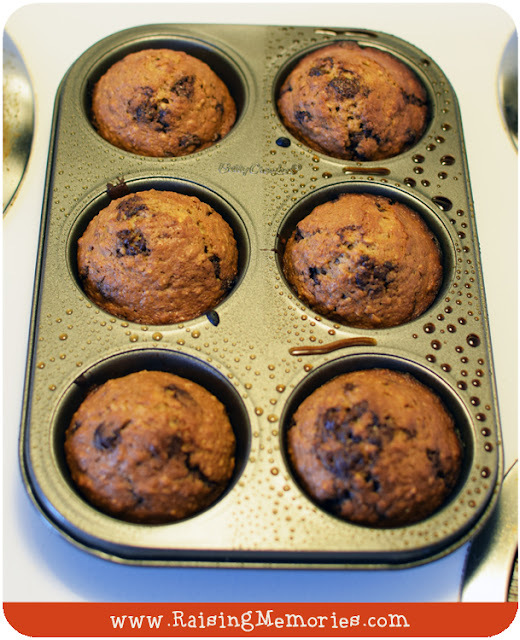 This photo is of muffins that cooked at the same time, in the same temperature. The ones that weren't cooked with PAM definitely burnt on the edges! That alone is enough to convince me that it's better to go with PAM. What a fun experiment this was! :) It makes me curious about testing and comparing other products because there are definitely differences between different brands! Disclosure: I am participating in the PAM No Residue blog comparison program with enCompass Media. I've received payment as a thank you for participating and sharing my honest opinion. Seriously, the difference you just showed has totally got me pitching my NO NAME. I am serious. I hate that black sticky stuff. It makes me twitchy! haha :) Seriously! It is no fun to clean and so hard to get off! That's truly amazing!! I never realized how well PAM worked! I thought all baking sprays were the same! Obviously, I need some PAM in my kitchen! There really is quite a difference- I mean, even if you don't care how your pans look, we all care about tasting burnt food! Really cool - love the way you did the test and really surprising just how different the two brands are. We've always used PAM at our house - glad we made the right choice! I agree! When you're using one product (and have nothing to compare it to), you wouldn't be able to notice the difference- I probably would've thought that I just overcooked my muffins- but here's proof that it had more to do with the cooking spray than the cooking time! Wow, your pictures sure are worth a thousand words! What a difference! 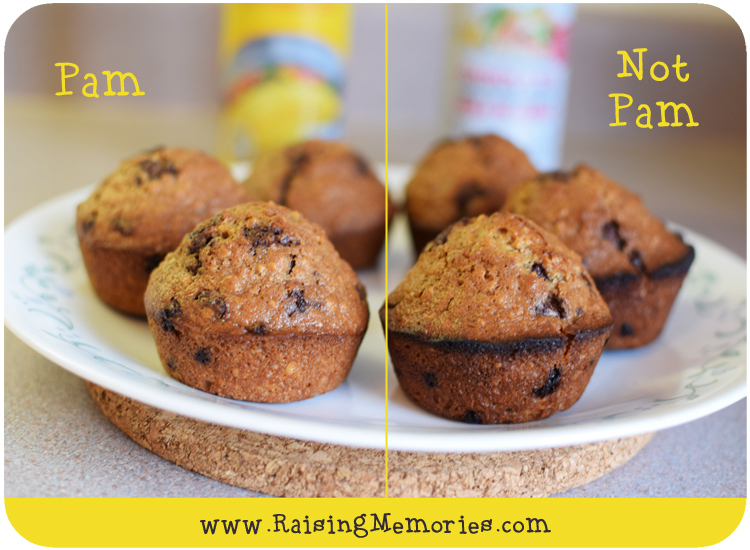 It is interesting to see the difference in the Pam muffins and the burnt ones. That was the most impressive difference to me, too! There was no difference in cooking time since they cooked in the same pan- the cooking spray was the only thing that changed! Thanks you can sure see the difference in the photo,i will be changing to Pam! There are so many products that would be interesting to compare but I never seem to find the time. Thanks for doing the work and sharing your results.